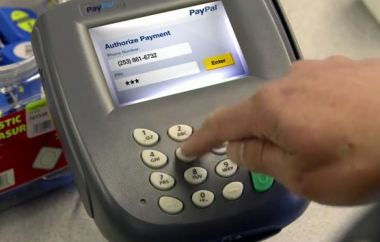 On the heels of the announcement that PayPal was losing its top executive to Yahoo, a convenient leak today revealed the name of the big-box retailer PayPal is working with on its first point-of-sale trial. In a note sent to investors today, Gil Luria, an analyst at Wedbush Securities, was the first to disclose the relationship between the eBay-owned company and Home Depot. “We speculate that Home Depot may be one of the first retailers to roll out PayPal at the point of sale,” Luria said. Home Depot is obviously a huge win for PayPal, which until now had only provided online payment solutions to customers. The pilot, which went live in December, allows employees to pay for items at the register using a PayPal-issued credit card or by entering their mobile phone number into the point-of-sale device at the register. Neither solution uses near field communication, which can be a limiting factor for adoption. More pilots are expected to take place early this year, but PayPal has been reluctant to name its partners, because it wants the retailers to be the ones to make the announcement when they are ready. On Wednesday, Yahoo officially announced that it had hired PayPal President Scott Thompson as its new CEO, shocking executives at eBay, including CEO John Donahoe. In an interview, Donahoe downplayed Thompson’s role in the company’s emerging mobile payments business by saying that the whole team participated heavily in the 2012 plan. On Wednesday, eBay’s stock sank nearly 4 percent to close at $30.16. Today, it closed at $30.63. Luria has an “outperform” rating on the eBay stock, and a 12-month price target of $48 a share.